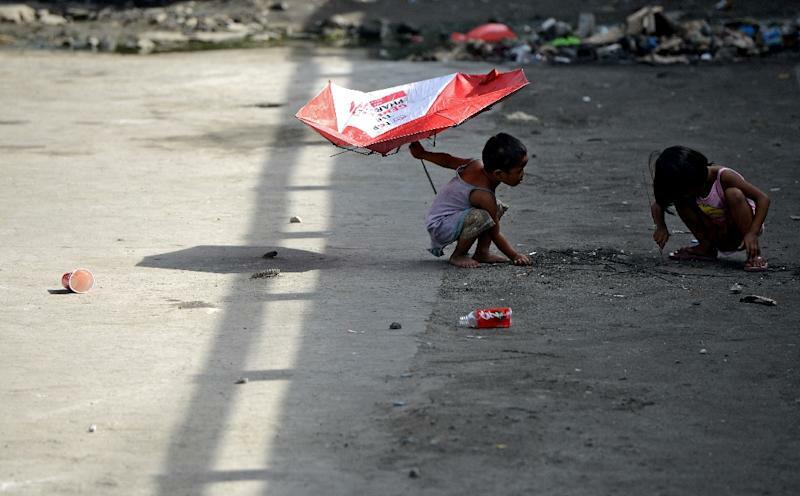 Manila (AFP) - Children in the Philippines suffer from "sub-Saharan levels" of malnutrition that stunts growth in a people who have traditionally been considered short because of genetics, a campaign group said Thursday. Although economic growth has surged in recent years, chronic malnutrition means the country has more stunted children than Ethiopia or the Republic of Congo, the Save the Children Fund said in a new report. "The assumption has always been that Filipinos are just genetically short but what we actually see now are generations of stunted and malnourished children," said Amado Parawan, the group's health and nutrition adviser. About one in three children under five years of age is suffers from stunting said the charity. "Sometimes, the families may hide such children out of shame that they cannot feed them," Parawan told AFP. "Because 'shortness' is considered a racial trait, it is not seen as a serious concern (but) stunting is more than just being short, it impacts children’s future because it hinders physical and mental growth," Parawan told a news conference. Data collated by Save the Children showed Filipino men were on average five feet, three inches (1.6 metres) tall, one of the shortest in Southeast Asia, he said. Men in the 10-member Association fo Southeast Asia bloc are, on average, an inch taller, with Singaporean and Thai males the tallest at about five feet, seven inches, Parawan said. The global average for men is five feet six inches, he said. International studies have showed the Philippines has the ninth largest proportion of stunted children, the group said. India is the world's worst affected nation. Manila's own surveys in 2014 showed one in 10 Filipino families lived in extreme poverty -- defined as earning 41 pesos (88 US cents) or less a day -- Save the Children added. One in four Filipino children sometimes skipped meals, and as many as 1.5 million sometimes went a whole day without a single meal, the group said. "These figures are sub-Saharan Africa levels of malnutrition," said Ned Olney, Save the Children's country director, adding little improvement has been seen in recent years. He urged the government to implement measures to ensure children are well-fed, especially in the first 1,000 days after birth. Failure to address malnutrition will lead to many physically and mentally impaired people, hurting economic growth, Olney warned.